The Prohibited 5th Degree vaporizer is one of the most versatile devices we ever got the chance to test. It’s a multipurpose dry herb and concentrates device that uses two types of chambers and tree temperature settings. It’s also a “smart” vaporizer as it adjusts between operating modes depending on the type of cartridge you slide in. This vaporizer also looks sleek and it’s very portable. It is available in four different colors - white, black, teal and purple and the presentation is just top notch. The device comes packed in a cardboard and hard plastic case, with the vape being visible from the top. I have to say that it was hard figuring out how to open the box in the beginning. I decided to put it aside for a day before doing the unboxing and reviewing this multi use vaporizer. Inside you will find the device fitted with the wax chamber on top. You also get a dry herb chamber and three screens, a charging cable, a wall adapter, a brush and a pick tool. The Prohibited 5th Degree weed vaporizer is designed to fit perfectly in the palm of your hand. It has a good amount of weight to it to feel balanced and it can easily be carried around inside a pocket or purse. On the top side we have the mouthpiece, which is made of plastic and doesn’t burn the lips. Then we have the cartridge or chamber which is magnetic and easily snaps into place. The power button is placed in the middle with the three LED notification lights underneath. 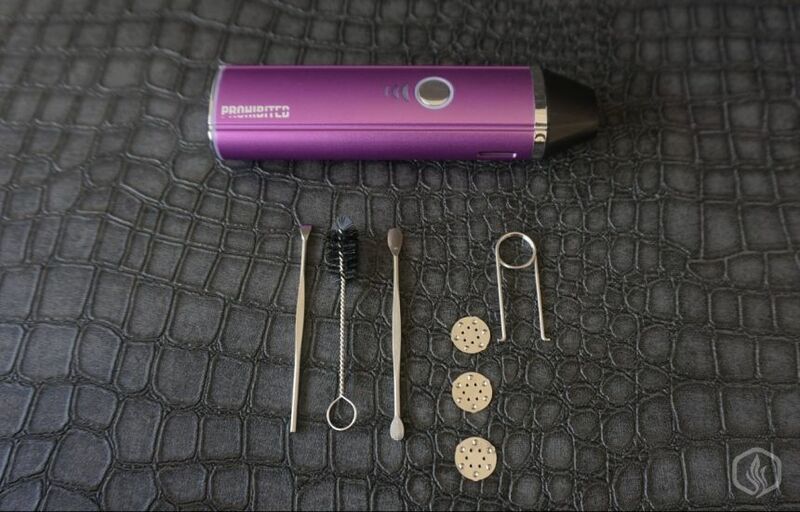 To recharge the herb vaporizer you simply need to take the connector and get it close to the base. It will automatically snap into place and the magnets are pretty strong to hold the device suspended. A notification LED light on the base will let you know when the process is complete. From our experience it takes anywhere between 2 - 3 hours for a full charge. It all depends if you use the wall adapter or your laptop’s USB port and how drained the battery was in the first place. To turn the Prohibited 5th Degree vaporizer on just press the fire button for three consecutive times. Then press the button twice to select a desired temperature or voltage. When using the dry herb cartridge one line means 390F, two lines are 415F and three lines represent 440F, which is the maximum temperature. With the dab chamber one line meas 3.7V, two lines are 4.2V and three lines represent 4.7V. We recommend using the 415F/4.2V setting as it offers perfect balance between vapor temperature and flavor. With the dry herb chamber on, after selecting the temperature keep the button pressed for a couple of seconds. It will automatically start to heat up and the base LED light will cycle through red - orange - green. It takes less than 45s for the device to reach maximum temperature and a session lasts for little over 2 minutes. When using the waxes chamber you simply need to press the button while inhaling. Performance-wise the Prohibited 5th Degree is one of the most versatile vaporizers on the market today. It automatically changes its operating mode depending on the type of chamber you slide in and works like a charm. You can easily swap between dry herb and concentrates without mess and the three temperature / voltage settings have been selected ideally. 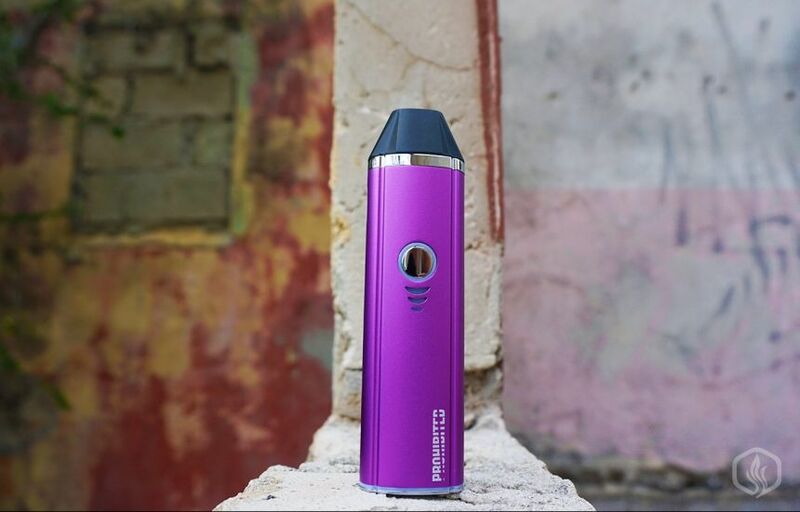 Vapor production and flavor are off the charts and the only con is battery life and the user-friendliness of the packaging which could be a bit better.We're still not sure if this is the same product as one of the V2 pro series 7. We will find out soon when comparing. This week we received two new cartridges for the Prohibited 5th Degree dry herb device. One is a glass E-Rig attachment, designed specifically for concentrates, while the other is an electronic nectar collector tool that will totally revolutionize your dab experience. Looks like Prohibited really stepped up their game and released two revolutionary new accessories that are nothing like we've seen before. Both these cartridges are intended for dabs and they will transform the tiny vaporizer into a supreme electronic tool for concentrates. The E-Rig cartridge is a true game changer and it features a glass bubbler attachment as well as three interchangeable e-nails. It's capable of reaching temperatures of up to 450C and delivers super-concentrated vapor, similar to that of an actual dab rig. The Prohibited E-Rig cartridge comes packed in high quality travel case, with foam insertions on the interior. It includes a slot for the vaporizer itself, which is not included, and comes with a variety of accessories: Quartz, Titanium and Ceramic e-nails, glass bubbler, a weighted base, a metallic e-nail topper, and three silicone containers. To use this E-Rig you must first slide in the magnetic cartridge. As with the two cartridges that came with the vaporizer, this one also has a microchip on the base. It will let the device know you're using the E-Rig attachment and it will adjust power and operating mode automatically. Once the cartridge is in, you can mount the glass bubble attachment and use the weighted magnetic base to sit the device vertically. Put some dab inside the e-nail, and press the fire button five times to activate the vaporizer. The light will glow red as it gets up to temperature and once it's ready you will place the topper over the e-nail and start inhaling through the mouthpiece. The Dabber cartridge is a revolutionary device and it's definitely the first one of its kind that we get to test. It's like an electronic version of the nectar collector and provides a mess-free experience that puts you in full control of your concentrates experience. This attachment comes packed in a cylindrical cardboard box. 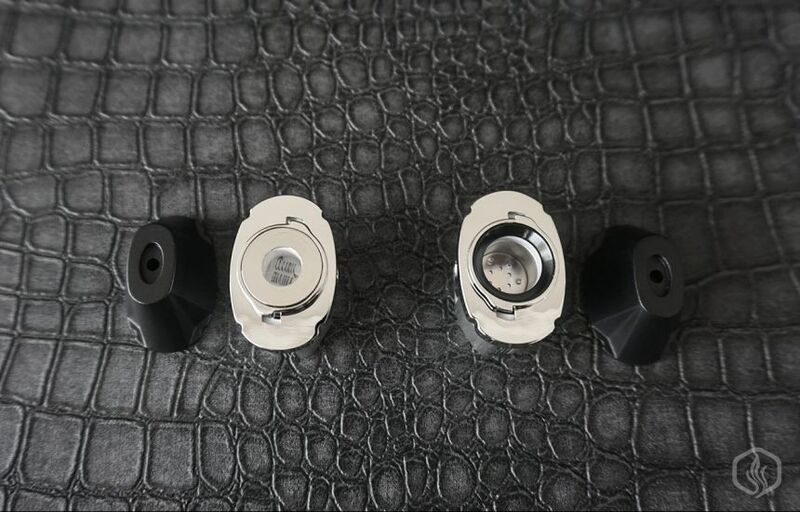 Inside you will find the Dabber accessory, a dummy Prohibited vaporizer for demo purposes as well as a nice magnetic end cap featuring a concentrates reservoir. The tip is detachable and it's made from a Titanium coil wrapped around a Quartz rod. It allows for precise dosing as well as conservation of the dab material. Also with the included concentrates reservoir you can easily enjoy your vape on the go. Turning the 5th Degree into a dab wax pen takes a couple of simple steps. To use the Dabber cartridge, you simply need to slide in your Prohibited 5th Degree vaporizer until it makes a firm contact. After that, just turn on the device and it will heat up instantly as soon as you press the button. Place some dab in the concentrates reservoir, and touch it with the red hot tip as you inhale from the mouthpiece. It's a touch-and-go process that eliminates the need for additional concentrates tools and messy loading. While you do get a concentrates cartridge together with the Prohibited 5th Degree vaporizer, that one is mostly intended for beginners and casual users. After using the E-Rig and the Dabber attachments for a couple of days we can clearly conclude that these two deliver far superior vapor and flavor. As a matter of fact, these are some of the best concentrates devices we've tested and it's something we definitely recommend. If you're a regular dab user and would like a mess-free, on the go experience, then these two cartridges offer incredible value for money.